We’re relaunching a service that lets you make notifications when some key real-world things happen in Washington. 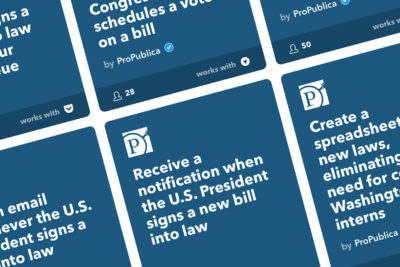 One of the Sunlight Foundation projects that ProPublica adopted late last year is a service that you can use to be notified when some key things happen in Washington — for instance, when President Trump signs a bill into law, or when a bill is introduced that covers something you’re interested in. These notifications are part of a service called IFTTT (which stands for IF This, Then That), which lets non-coders create small “applets” that connect web services and devices. So, for example, you can record your fitness tracker’s daily data in a Google spreadsheet or make a connected light bulb blink on when you get an email from a certain person. President Trump signs a bill into law. A new bill is introduced that matches a search term you provide. 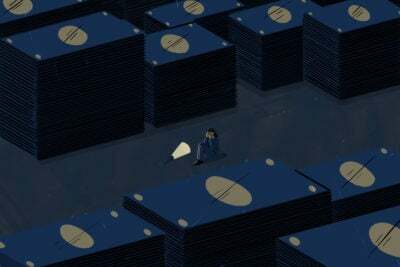 The House or Senate schedules a bill for consideration. A new lawmaker representing you enters Congress. A member of Congress has a birthday. Now that ProPublica has its own IFTTT channel, we’d like to hear from you about what other applets we should provide. For instance, we’ve got campaign finance data that isn’t yet hooked up to any IFTTT applets. What interesting things could we build with that? Let us know in the comments or on Twitter at @propubnerds.